Campaign-Federal League Campaign-Secession London Failure Forgetting A Federated State ? James MacCallum Smith was born near Inverness in Scotland. He was a staunch secessionist who used his newspaper the Sunday Times to promote his secessionist views. Smith worked in newspaper administration in Inverness, Sydney, the Western Australian goldfields and in Perth. He moved to Coolgardie in 1893 where he established a number of newspapers, including the goldfields' first Sunday newspaper, the Sun in 1898. After the death of Frederick Vosper in 1901 he and his partner, Arthur Reid, bought the Sunday Times. 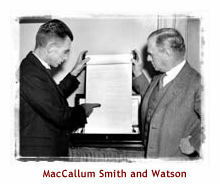 Smith became the sole proprietor and managing director in 1912 and remained so until 1935. The Sunday Times published its first pro-secessionist articles in 1907 and continued its agitation for the next twenty five years, under the guidance of its editor Alfred Chandler. Smith was a committed secessionist and entered public life in 1914 when he was elected to the seat of North Perth in the Legislative Assembly, a seat he held until his death in 1939. Although Smith was criticised for not mentioning secession in his 1930 election manifesto, he backed the campaign during the secession referendum campaign and in 1934 he was appointed to the Western Australian delegation to present the petition to the British Parliament.